Commercial Construction | Atlas Piers of Atlanta, Inc.
Get your business off to a solid start with the Atlas team! Our new commercial construction foundation pile application will ensure that your structure will never suffer from settlement issues. We pride ourselves on our ability to manage every commercial project personally, while completing them efficiently and cost effectively. We realize that each new construction project can be a large investment. We want to help you protect and maximize that investment by assisting you to build your commercial structure on a permanently secure foundation. 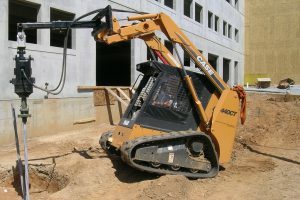 When we do commercial foundation construction, we thoroughly assess what type of foundation is right for your structure. Then, we test the soil in the area to ensure that it can provide the support you need. If needed, we bring in additions or new fill soil, or we look into other solutions to help support your new foundation. In particular, we often use piling to support commercial foundations. Our new construction foundation pile application will ensure that your structure will never suffer from settlement issues. We realize that each new construction project can be a large investment. We want to help you protect and maximize that investment by assisting you to build your commercial structure on a permanently secure foundation. Putting together a building is a huge project with lots of different components. So that your project stays on track, we utilize a range of expert project planning tools and processed. We pride ourselves on our ability to manage every commercial project personally, while also completing them efficiently and cost effectively. Our objective is to always help our clients complete their projects on time and on budget. We work with both you and your building team to ensure that the foundation placement works with your general building schedule. We have new construction helical piles, and they range in capacity from 40,000 pounds to 250,000 pounds. That’s the ultimate capacity of each helical pile, and we can utilize multiple piles in each foundation to perfectly meet your needs. Helical piles provide the perfect support for your new commercial construction projects. They are hydraulically advanced, and they rotate deep into the ground to find suitable and stable soil to support your foundation. This approach provides permanent structural support to the foundation, and it will adequately prevent foundation settlement in the future. When you see buildings sinking into the soil, leaning to the side, or getting cracks in their foundations, that’s usually because they didn’t have a strong enough foundation to begin with. We provide quality commercial foundation construction so you don’t have to worry about any of those risks. Helical piles are often the best solution for commercial construction, because they are quickly installed, ready for immediate load transfer, are easily tested to verify load capacity, and provide verified, measured support. Helical piles can also be installed in all weather conditions, create no spoils and very little disturbance to the job site. Helical piles work and are often recommended because they work well with most soil types and provide a vibration free installation. Capacities from 40,000 lbs. to 250,000 lbs. Being that commercial construction projects are such major investments, it’s extremely important to hire a company that you trust. Atlas Piers has been in business for over 30 years. We have made the steel foundation industry our sole focus, and as a result we have mastered our processes and continue to make new advancements every day. 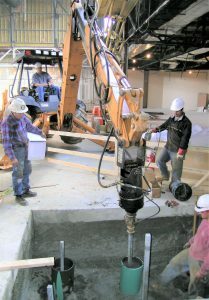 Helical piles provide the perfect support for your new commercial construction projects. They are hydraulically advanced/rotated deep into the ground into suitable and stable soil. This provides permanent structural support to the foundation and will prevent foundation settlement in the future. Helical piles are often the best solution for commercial construction, because they are quickly installed, ready for immediate load transfer, are easily tested to verify load capacity, and provide verified, measured support. Helical piles can also be installed in all weather conditions, create no spoils and very little disturbance to the job site. Helical piles work are often recommended because they work well with most soil types and provide a vibration free installation. We only provide commercial construction products that offer the highest level of support for your foundation. Since being founded in 1987, we have grown to be the leader in foundation repair in Atlanta, Georgia. Our pier/underpinning systems provide the stabilization needed to counteract common problems such as expansive soils, high water tables, and erosion. Having your commercial construction done right the first time will prevent costly foundation problems later. Contact the Atlas team today to set up an appointment, talk about design, or get a free project concept or product selection.